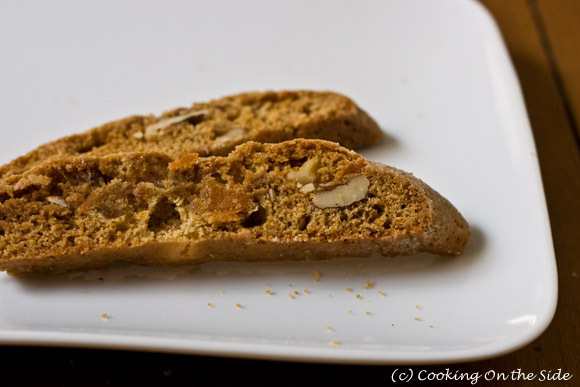 I have been holding onto this Gingerbread Biscotti recipe for months now, waiting for the holidays to give it a try. It was definitely worth the wait, although I wish I’d tried it much sooner – they are fantastic! Most of the biscotti I’ve had in the past have been tasty but not especially noteworthy on their own. They usually come to life upon being dunked in a nice cup of coffee or tea. 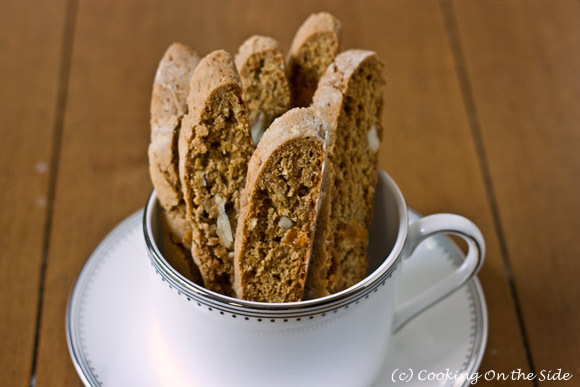 But these spices within these Gingerbread Biscotti, along with the fresh ginger and dried apricots mixed in, have wonderful flavor all on their own. I confess to having enjoyed several without even dunking. Cream butter, sugar, ground ginger and allspice until light and fluffy. Beat in eggs, molasses and chopped ginger root. Combine flour, baking soda and salt; blend into butter mixture. Mix in almonds and apricots. Chill dough for ease of handling (I let the dough chill for about 30 minutes). Divide dough in half. On a lightly floured surface, shape each portion into two 12-inch long logs. Place logs on a lightly buttered or parchment lined cookie sheet (ensure there are several inches of space between the logs, as they will spread as they bake). Bake 30-35 minutes or until firm. Cool and cut diagonally into 3/8-inch slices. Place slices on a cookie sheet and bake at 250°F for approximately one hour to dry the biscotti. .-= Jamieanne´s last blog ..Cupcake Hero Extended! =-. These sound so wonderful. Perfect for the holidays. Thanks for sharing!! .-= Kathleen´s last blog ..Snickerdoodles =-. .-= ABowlOfMush´s last blog ..Mini Star-Topped Mince Pies =-. 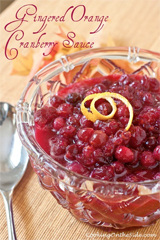 I think this would go good with the Vermont Maple coffee from Harry and David’s! .-= Nate´s last blog ..Chinese Almond Cookie Recipe =-. 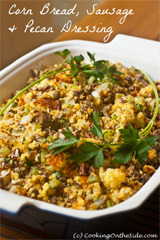 .-= kellypea´s last blog ..“Creamy” Asparagus Soup =-. There are so many biscotti recipes worthy of trying. This one has been put on the list. .-= The Duo Dishes´s last blog ..The Search Is Over =-. Hi Kathy, I love the sound of these biscotti and plan to make them, however, I just wanted to check that the quantity of fresh ginger is indeed, 1/4 cup? Thanks Kathy, also for the link. 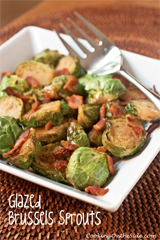 I would love to try them with a large cup of hot chocolate! Just made these. Didn’t have almonds so I used pine nuts. I think they will work will with the spiciness of the gingerbread. I also used 1/2 brown sugar and 2-1 all purpose whole wheat flour to white flour. 5 more minutes till they come out of the over, but I already know that the crunchy end pieces left over when I sliced it tasted divine. Sounds fantastic, Kelly – I hope you love them!